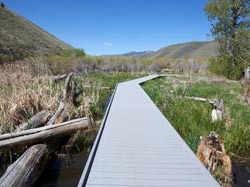 Wildlife lovers will have a one-month window to explore nature in the middle of Hailey when the Draper Preserve opens its boardwalk this Saturday, May 12. It will close June 15 for construction of a new entryway bridge. The Draper Preserve is an 80-acre parcel of land behind Lion's Park in Hailey. The site of a former city dump, the area was acquired by the Wood River Land Trust in 2007, and is now an accessible wetlands area that nature enthusiasts can explore via a floating boardwalk. Wood River Land Trust Executive Director Scott Boettger said the project was a long time coming. Before the boardwalk could even be started, he said, 600 cubic yards of waste had to be removed, boosting project costs to $200,000. "It was much more than we ever thought." And instead of simply moving all the waste material to another landfill, the organization took a different approach, filtering the waste to separate usable soil and gravel from the metal and other non-decomposing materials. "We reduced the waste to one-tenth of what it was," Boettger said. "It cost more, but in the long run, it's better." The soil has been stockpiled for use in future land trust restoration projects, and the gravel will be used in the roadbed leading to the Draper Preserve bridge and boardwalk, Boettger said. When completed, the entire trail and boardwalk will cover nearly a quarter of a mile, part of which actually travels over the wetlands near the park. Boettger said that when the organization had cleaned up the area, they realized they didn't want to further damage the existing wetlands. "You could almost see the [wetlands]," he said. "But we didn't want it just trampled." Boettger said that the construction process of the boardwalk did cause some initial disturbance to the area, but the area has already mainly recovered. "You can't even tell anything has happened," he said. The boardwalk itself is constructed to intrude only minimally on the riparian habitat, he added. The platform is suspended from posts anchored on concrete piers, with water flowing freely under the boardwalk. The best part, Boettger said, is that the boardwalk provides a unique opportunity for nature lovers to explore the wetlands with ease. "You don't have to put on waders to experience it," Boettger said with a laugh. "And since there are no bugs right now, it's the perfect time to see it." The preserve is home to wood ducks, mallards and other duck species as well as muskrats, brook trout and the occasional freshwater shrimp and riparian insect. "You can't help but notice them when you stop and look, because you're walking right over the top of them," Boettger said. A resident started using the boardwalk, Boettger said, when deep snow made the boardwalk an easy way to traverse the wetlands. Boettger said people should take advantage of the boardwalk while it's open, but to refrain from fishing or from letting dogs chase the wildlife—though well-controlled or leashed dogs are always welcome.